Annette Cormier, Enterprise Solutions Manager, Dell, Inc. In 2010 and beyond, how much will you invest to maintain existing IT infrastructure versus new IT investment that can provide real business impact? The answer could determine the fate of your organization’s competitiveness. In this live BrightTALK Summit Keynote presentation, Annette Cormier will outline our Efficient Enterprise strategy and provide you with a pragmatic approach to deliver efficiency through standardization, simplification and automation. This strategy will help you free up budget and resources to enhance efficiency and help drive your company’s success. Join Dell and our partners, EMC and VMware, at this BrightTALK Summit to learn how to make 2010 the year of your Efficient Enterprise leveraging the latest advances in virtualization platforms, storage, business continuity and services. As organizations look to maximize investments in the heterogeneous data center, the issue of vendor interoperability comes to the fore. Capitalizing on multi-vendor industry standards is at the heart of any data center optimization effort. A standards-based approach to IT management can lead to increased flexibility and reduced costs. This session will address the challenges and opportunities in a multi-vendor environment, and explain how the DMTF's Virtualization Management Initiative (VMAN) and standards including the Open Virtualization Format (OVF) and the Virtualization Management Profiles address these issues to form the foundation of an interoperable end-to-end management strategy in today's distributed infrastructures. This session will describes key considerations for securing virtualized infrastructure including opportunities for improving security with virtualization. 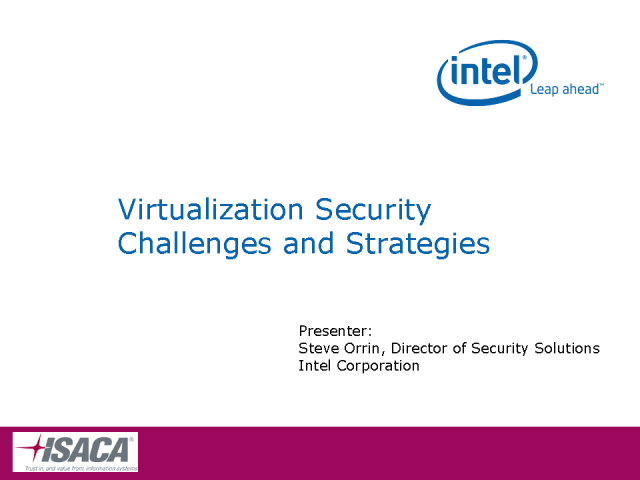 Examples of virtualization security solutions will be shared. Andrew Gilman, Storage Solutions Manager, Dell, Inc.